After doing free workshop in Bangalore and Pune, next stop of free workshop was in Chennai which I delivered on 9th Jan’16. 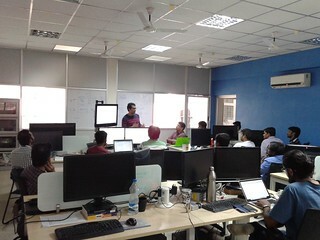 I got few registrations for Chennai last month but after announcing it on Chennai Linux User group, I got more registrations. I was looking for a community space to host the workshop as it was free one. Thanks to Shakthi, System Insights provided the space and sponsored the lunch as well. We scheduled half day workshop (9AM – 2 PM) as I later we planned to got to Linux User Group meeting, which got cancelled for some reason. Due to fog, my flight got delayed and I reached Chennai ~10 AM and started the workshop at 10:40 AM. Luckily no body left till then and because of the LUG meeting cancellation we could stretch upto 3 PM. I tried my best to cover full day workshop’s content in limited time. I hope the it was worth their waiting time. One of other feedback I got that I should cover more basics, on which I try to improve. Next free one day workshops are scheduled in Hyderabad, Delhi, Kolkata and Virtual. Also first two days paid workshop is scheduled Bangalore on 23rd – 24th Jan’16 and Pune one would be announced soon. Get updates on latest courses and tools. We are here to help you learn and deploy cloud native application using containers. With our trainings, you would get in-depth knowledge on the subject and with our consulting services, we can guide to do the deployment.